A few months ago Eric Weinstein and Drew Israel drove all the way down to Washington, D.C., from New York City (and drove back the same day) just so I could put Eric through a workout. Drew wanted me to hammer Eric hard like the workouts we had together at my place last year. Eric wanted it that way, too, and was expecting the type of grueling workout that would make Freddy Krueger proud. Eric is 33 years old, 5’9’’ and a solid 195 lbs. He’s the throwback type—tough, motivated, strong and extremely polite. I’ve gotten to know him, Dr. Ken, Jim Duggan, Jamie LaBelle and other members of the “Iron Island gang” pretty well from my visits to Drew’s place, and Drew’s several previous visits here. Eric and I have trained together at Drew’s a few times, and then gone out to Peter Luger’s Steak House after the workout. This is not a regular habit for any of us, just a tradition when we all get together. Eric has been training with Dr. Ken since he (Eric) was 16; he has also trained with Drew for several years. 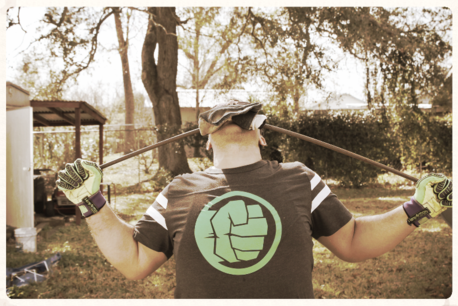 So it goes without saying that Eric has excellent mental focus, and flawless form. Since I knew Eric was a high-intensity-training veteran, I did not have to use the same caution that I would with a beginner off the street. Eric wanted me to put him through a workout on my turf, to add to his collection. Some people collect stamps, others collect coins. Eric collects workouts. I knew that Eric was used to being hammered by Dr. Ken, so I didn’t want to let Eric down. I was pulling no punches and planned on giving Eric a workout to remember. Then it was over to the Hammer Iso-Lateral Row for a set to failure with 200 lbs followed by a few forced reps.
As soon as he got off the Hammer machine I had him go to the 2-inch thick bar for a high-rep set to failure with 75 lbs in the reverse curl, with special emphasis on lowering the bar slowly (at least 5-6 seconds per negative). As soon as he hit failure he put the bar down and gave his hands a shake. Then he picked the bar right back up for a set of regular curls (palms up) to failure, again with emphasis on lowering the bar very slowly. As soon as he put the bar down it was back to the reverse curl for a final all-out set. I then let him take a one-minute rest. Eric repeated this sequence of Horizontal Tru-Press, Iso-Lateral Row and curls two more times, to failure. On the third (last) time he pushed (in the Tru-Press) and pulled (in the Iso Row) for ten seconds in a static contraction after reaching muscular failure. The reverse curls got his forearms bulging and swollen with blood. His hands, wrists and forearms were so “nuked” that he had a hard time holding onto the handles of the Iso Row on the third series. As soon as Eric had put down the bar after the third series, it was “Get right up!” on the Hammer Iso-Lateral Leg Press for one set to failure with 430 lbs. Each rep was done with a dead-stop pause at the bottom. 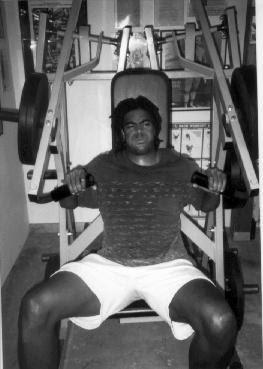 The seat was set near the “tightest” position so that Eric’s knees sunk into his chest at the bottom. After 10 reps he was breathing like a steam engine, and paused to take ten deep breaths. He made it to 15 reps and then started to scream on every rep. Drew and I were screaming too! “C’mon Eric, get to 20! One at a time...puuussshhh...” Eric made it to 20 reps, and was shaking. A few reps later he started to moan between the screams, as he approached the end of the set. He paused to take about fifteen deep breaths and kept the set going, with each rep being an all-out, painful, life-and-death effort. He made it to 30 reps before collapsing in the machine. He then rolled to the floor and stayed there for a few minutes. The set was a great effort! 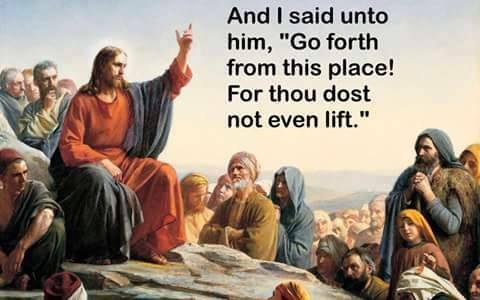 Most people would have stopped at 15 reps. Most people would have been KOed and done with training right now, but not Eric. I knew he would bounce back. He was used to this type of training from all the brutal stuff Ken and Drew do to him. This was just a regular training day for Eric! After a few minutes of rest, we continued. Eric did a few high-rep sets to failure on the Hammer Behind Neck Press with 160 lbs, then a few sets to failure on the Hammer Pulldown with 170, each with a ten-second static contraction on the last set. I threw in some manual resistance for his shoulders, some grip work, and some calf work. We then went to the Tru-Squat as we wanted to finish with some “ground-based” training. (My tongue-in-cheek definition of “ground-based training,” as coined by Jamie LaBelle, is “ending up on the ground” after a hard set, and has nothing to do with having your feet on the ground.) Eric did a set of 20 reps with 200 lbs, which was even harder than and took more effort than the leg press set. After the twentieth rep, Eric was on the ground for about ten minutes. We went outside to sandbag alley where I store my sandbags. Eric was exhausted, but got a second wind after the needed rest and a big glass of water. He wrestled with the 200-lb bag and carried it over the course of 225 feet in well under the ten-minute time limit. He only put the bag down a few times, and probably could have done 225 lbs. He had been practicing the sandbag carry with Drew, and wasn’t coming all the way down here unless he got his name put on the bag. Drew has been training with over 300 lbs in the sandbag carry. 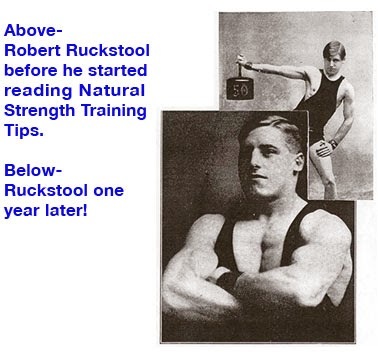 Rumor has it that Drew will attempt 350 lbs to set a new Whelan Strength Training record at the second annual Capital City NSCA Clinic (see ad after this article). Big Melvin Tuten holds the current record of 325 lbs, which he got in his last workout before reporting to the Cincinnati Bengals in July. Eric slumped for a few minutes against the fence that borders the alley, to let his racing heart and steam-engine breathing get back to normal levels. He did a great job today and worked extremely hard, but was glad the workout was over. All he wanted now was a good meal and a good bed! I put his name on the bag with a magic marker. We were all hoarse from screaming. Shortly afterwards we headed for Morton’s to watch Drew (6’4’’ and 310 lbs) set new world records. Nothing like it after a brutal workout. Good workout, good food, good friends; ah, life is good! 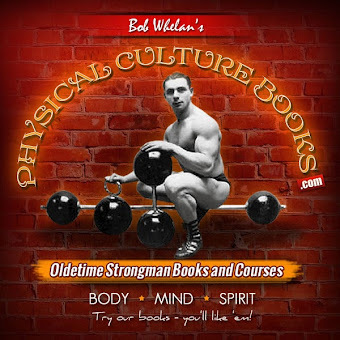 “Maximum” Bob Whelan runs Whelan Strength Training in Washington, D.C. I would like to share some of my personal experiences in dealing with people who have used or are currently using steroids or other strength enhancing drugs. I was in a relationship with someone who has used anabolic steroids. In this relationship I saw this person hallucinate, talk to himself on occasion (as if someone were therefore), submit himself to self-inflicted pain, experience low self-esteem, have a very bad temper, and threaten to commit suicide. This situation was the very first situation that I have ever had to deal with on a personal basis. The relationship ended a little over a year and a half ago. In dealing with this situation, it caused me total stress, because I thought that I could fix this person's problem myself instead of leaving it in the hands of God. This situation put my health in jeopardy, both mentally, physically, and emotionally. I thank God that he gave me the strength to stand up and to see things in the way in which I had refused to see them. This person never told to me that he was using steroids until people around me started suspecting it. When I asked him about it, he was in total denial about it. I continued to ask him about it and finally got an answer. The answer was "yes," he was using steroids. I suppose I was lucky that I finally got the truth out of this individual. Even though I didn't have any control over the situation, at least I knew what he was doing and what the end result could be. There are people every day who lose people that they love due to steroid abuse, who never have a clue that their loved-one was using drugs. HOW CAN THESE USERS BE SO SELFISH? I received a phone call from someone who was calling around, searching for answers. I called this individual back, not knowing where the call would lead. The caller asked me if I knew a certain individual. I thought about it and asked if he was a powerlifter. The caller said yes, he was a body builder and powerlifter. I asked her if he had attended a meet late last year, and she confirmed that he had. She then told me that her husband had died in March of this year. I was totally stunned. The doctors told her that he had a heart attack. When the autopsy was completed they asked her if her husband was a drug addict. She had no clue. We talked for a while and she told me that she never knew that her husband used any drugs. He sold supplements and was very health conscious. She said that they were devout Christians and that he was a good man. HOW COULD HE BE SO SELFISH? He has left a wife totally confused and alone. She will wonder all her life about why he never confided in her. She will wonder if she ever really knew the man she married. I think that this is just one example of the lies and deceit that go along with drug use. The people who choose to use drugs are SELFISH, they are only concerned with the way they look, how big they get, and how strong they appear to be. They don't think of the circumstances. They don't think about their family and friends. They don't realize that in their quest to be super humans, that they will possibly ruin the lives of people who love and care for them. IS IT REALLY WORTH IT? DO YOU WANT TO DIE BECAUSE OF STEROIDS AND HAVE THE CORONER ASK YOUR HUSBAND, WIFE, OF PARENTS IF YOU WERE A DRUG USER? You might think you look good on the outside, but you are ruining your insides. Your heart is growing to sizes unimaginable, your kidney and liver are being deprived. THIS IS NOT NORMAL. I ask again, WHY DO HAVE TO BE SO SELFISH? THINK ABOUT IT! I just wanted to add that not every athlete who dies of heart problems or some other health related problems are using drugs. People should not assume that they are. Those who are using the drugs know who they are and eventually the truth will come out. If you have any questions or comments, please feel free to write Kathy Roberts at P.O. Box 6605, Alexandria, VA 22306. A few months ago, there was a long discussion on one of the internet bodybuilding boards about the use of anabolic steroids. Most people, on reading that opening sentence are thinking, "So? That ain't a surprise!" They are right. It isn't a surprise. And that is a shame. The use of anabolic steroids has virtually destroyed what was once the greatest sport on earth! I'm talking about lifting weights here... not "bodybuilding" per se. Call the whole endeavor, "physical culture" and you are on the right track. 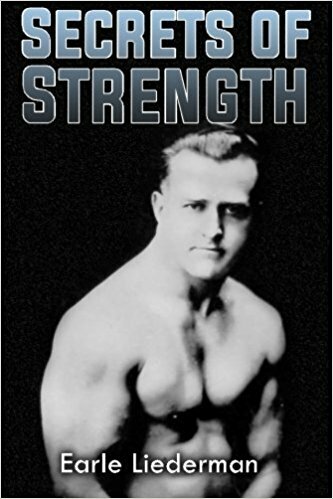 Way back when men decided that they wished to be bigger and stronger, the advice was relatively simple to get. The difficulty in learning the craft of physical culture wasn't so much in getting good advice as it was in finding someone who knew what lifting weights was! There wasn't this whole infrastructure of nonsense that there is today, and the crazy advice wasn't plastered on four out of five magazines on every newsstand. If someone went to a gym, and that gym happened to contain a few bodybuilders, the advice was readily available... whether the goal was to gain or lose weight. More importantly, the advice worked. Today, you can go just about any place in the world and find a gym. A gym full of pumpers and toners - and guys that take anabolic steroids because without them, they don't grow muscles. I had a conversation with a 'roid boy once. Basically, I explained that not only were steroids unnecessary but they were something that was ruining the sport. He asked me to explain myself. I explained that you could get as big as you wished just by lifting properly and eating correctly. After all, that is what the old-timers did! He laughed in my face and said that no old timer would win contests today! 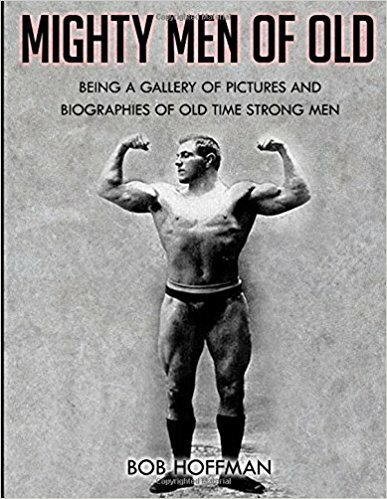 I mentioned that Doug Hepburn would blow most guys out of the water with his strength feats. He wouldn't hear a word of it. But he had struck a chord and I realized that the truth behind much of what we are experiencing today (having to do with performance enhancement) was linked directly to the almighty dollar. Athletes are marketable products. They are marketed for one reason only - they win medals or games, and that makes money. Nobody wants to pay money to see a mediocre performance, and advertisers certainly will not pay top dollar to attach their names to a loser. Unfortunately, with performance enhancing drugs, many athletes become losers when they refuse to start taking them. The end result? The athlete feels that he or she has no other option but to start using. One of the major issues directly linked to steroid use is food supplementation. Not that long ago, Weider was taken to court over his claim that his Anabolic Mega Packs (nothing more than vitamins) were as potent as anabolic steroids. The link in this situation is quite clear... promise the results of drugs, without having to use. The problem once again, is that the use of drugs is driving a sale. More specifically in this case, it is the promise of the benefits of drugs without the terrible side-effects. The horrific appearance of today's bodybuilder is freakishly absurd. In every single glossy magazine about bodybuilding, you are looking at people who's grossly unnatural development is a result of DRUGS, not training. The training that these guys do is so silly that most of the bodybuilders would grow better just leaving it out altogether. Those that actually DO train properly grow to such proportions that it renders them freaks for life, and takes a dastardly toll on their health. Read that again... most professional bodybuilders are actually so idiotic about their training, that it is a disadvantage. The drugs they take are more than enough to make up the difference! 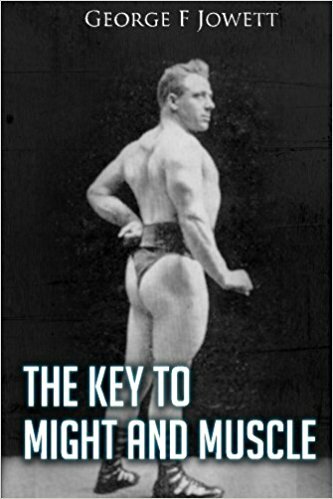 Now, when a neophyte lifter tries to learn about lifting, where is the most readily available source of information? Well, either the largest guy in his gym (who is genetically blessed, using drugs, or both) or from the magazines. What does he learn? He learns that he must "pump up" performing enormous amounts of useless work. The incredible volume of this information is such that even a well founded and clear argument against such training tactics will fall on deaf ears. You can actually explain the sound and reasonable principles behind lifting weights to a pumper, and they will admit that it makes sense... but they will continue to "blast," "bomb," and "blitz" their way to "behemoth biceps." All according to the muscle comic books. Most of the young guys fail on routines like this. How bad is it? If one out of a hundred new gym members keeps their membership for more than two years I'd be surprised. So why is the turnover so high? The information is BAD, plain and simple. But, you see, you don't need good information to grow muscles if you are taking enough drugs to cure the muscle wasting that is caused by having a nuclear warhead detonate right next to you! You just need the drugs. It is absolutely disgusting. AND, it is getting worse. Those guys that refuse to take drugs can now take garbage that is close enough to a steroid that it only needs one slight change to make it one. People like Mark McGwire are touted as heroes even after publicly admitting to using "pro-hormones" to enhance their athleticism. What kind of message is THAT sending to kids? Sales of compounds that are not just useless, but dangerous is easy to do! So called, "fat burners" contain stimulants that have killed people who have an unknown sensitivity to them. It is beyond me why ANYONE would bother. Basically, things have now gone over the edge. 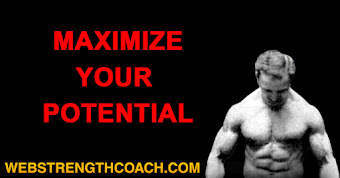 To the new trainees, you are either "toning" or you are a bodybuilder. And if you are a bodybuilder it is commonly believed that you must use both food supplements and drugs! The funny thing is, only in the last few years have bodybuilders become large to the point that they exceed what is capable without drugs. They are also dying in numbers that are far too high for their demographic. I have heard kids say, "I need to buff up man, I need some juice!" Believe me, they weren't talking about orange juice. So what do you do? Well, for one you begin to train honestly. You do not succumb to the temptation offered by the false-fix of drugs. It isn't even a fast fix. Squatting hard, eating big and dieting off the fat will get you in shape faster than any super-program that requires drugs to make it work. Think of it this way. The muscle magazines say that a 10 pound gain of lean tissue per year is a phenomenal amount of progress for a bodybuilder (assumed to be using drugs). Well, by following a 20 rep breathing squat program, Dr. Randall Strossen put on 30 pounds of muscle in six weeks! Unfortunately for the world at large, supplement companies have been so dishonest that the public has been conditioned not to believe outrageous claims... even though in this case they are true! And make no mistake! The companies that are selling supplements are directly linked to the drug industry. The supplements today are actually advertised as mimicking steroid-like gains! Consider this fact as well - it is not in the best interest of a bodybuilding product manufacturer for you to make gains. If you did, you would cease to purchase the miracle supplement that got you there. And if you don't take the supplement at all, but opt for steroids, the company will still gladly pay you to endorse the product. How closely linked are these "bodybuilding" companies with other sports? Well, EAS has members of the National Football League endorsing products, as many other supplement companies do. And EAS is one of the companies that produces and distributes "pro-hormones" which are nothing more than "almost steroids." Essentially, the industry that claims to be providing instruction on strength, health, and well being, is pushing a series of events that are leading the world to either get no gains at all, take risky drug-like supplements, or opt for the drugs themselves. And the bottom line here is that the walking advertisements of this industry aren't even bothering with the first two options. THEY just shoot up syringes full of anabolic agents to the tune of nearly $50,000.00 per month and PRESTO! Instant gains. Men from the golden age of strength didn't bother with drugs. They didn't bother will "isolation" work and "pumping up." They lifted weights in such a manner that they built incredible physical strength... and not just the ability to demonstrate strength either! They actually improved their body's capacity to tolerate exercise by working such things as their lungs, connective tissue, and stabilizing muscles. They applied themselves diligently and progressively... and the end result was a body that would not get injured, would not soften up and lose size if exercise was dropped for a few weeks, and they lived productive and healthy lives. Compare that with today's crop of athletes (if you can call them that). Today you have nothing but injuries, high blood pressure, weak stabilizers, tendon and ligament problems, heart conditions and early deaths. And that is among a group of people that are supposed to represent the HEALTHY benefits of training with weights! Andre said, "Image is everything." Andre was wrong. The image of the drug bloated monster, the image of the lighting fast athlete, the image of the greatest football player, or the fastest runner - these things are often just fakes. REALITY is everything. And the reality is that you can do it without drugs. 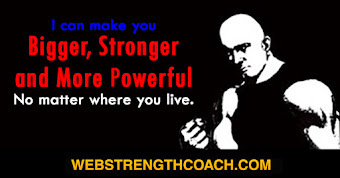 You can be bigger, stronger, faster and live longer and healthier without drugs. You can break records without drugs. You can make the industry thrive again. It is up to everyone on an individual level. And it is a choice you must make - to stay clean, and stay strong. Your children are counting on you.